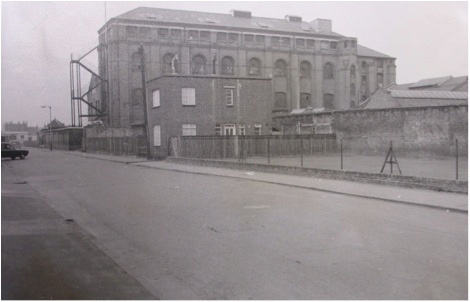 R Whites factory, Neate Street, 1969, looking west from the junction with Cobourg Road. This factory opened in 1887, on the previous site of a floor cloth manufactory; it stood where the floodlit football pitch is today. Demolished 1970s. Photo courtesy of SLHLA, P5987. 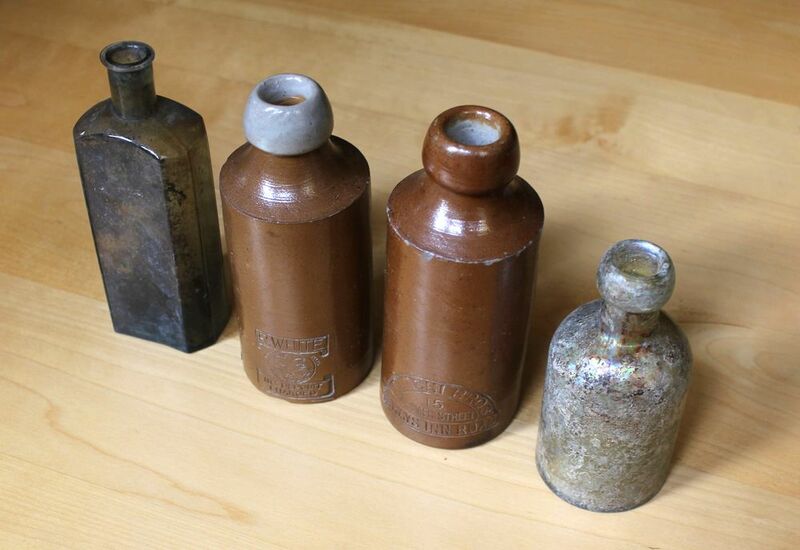 R. Whites began in 1845, with Robert and Mary White selling ginger beer in stone bottles from a barrow. Eventually it would engulf local rival Rawlings, with seven premises around the area. Locals recall the clatter of horses and carts used for distribution, and bottles bursting on hot days at the storage depots. London, 1845: Nelson’s column has just gone up, and the 25-inch Tom Thumb is P T Barnum’s latest attraction in fashionable society. Here in Camberwell, a more humble new arrival – 21-year-old Robert White and his wife Mary begin home-brewing R Whites Ginger Beer, selling it themselves in stone bottles from a barrow, at 8d a pop. A one horse, one cart operation. The business prospers, with lemonade soon added to the offerings – “made with real lemons”. In 1871 they open a factory in Cunard Street – where the multi-cultural garden stands today, behind Chumleigh Gardens. By then the area was filling fast with industrious new streets – packed with willing workers and thirsty customers. Testimonies fondly recall the clatter of horses and carts used for distribution, 1d back on returns, and on the hottest days, bottles bursting in the sun at the storage depots. Over the next 150 years R White’s would go on to engulf local rival Rawlings, and have factories and depots all over the area – two on Albany Road, Harling Street, two on Neate Street, New Church Road, and the last at Glengall Road in the 1990s. Their factories employed hundreds locally. In 1880 the Sons of R. White – Robert James and John George – joined the family business. Although ginger beer was still the leading product, the 1887 temptations included Jubilee Tangerine (capitalising on Queen Victoria’s 50 years on the throne), Jubilee Lemonade, Champagne Cider, and Seltzer Water, all available in Codd’s patent glass bottles. 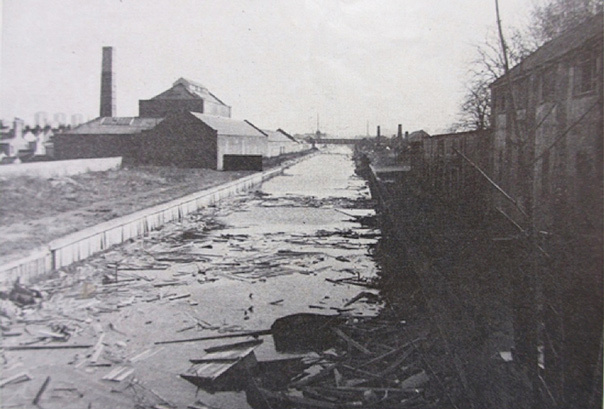 Grand Surrey Canal, 1970 seen here looking east from Wells Way showing the huge canal-side Rawlings factory, built circa 1880 and taken over by R Whites in 1891 (demolished 1986). Photo courtesy of SLHL. The 1890s saw the Rawlings take-over, limited company status attained, and new factories open in Camberwell and Barking – becoming the group’s main headquarters. Business was booming. Over 50 years, Robert White had grown the operation from the back of a barrow to a business empire with over £500,000 capital. Finally, in 1901, at the ripe old age of 77, he passed away. In the 1930s, already dealing a lot with corner shops, R Whites began making their own crisps at Albany Road, and sweets in New Church Road. Wartime bomb damage and sugar rationing would eventually do for sweet production. Ironically, elsewhere, residents recall R Whites lemonade being used to put out incendiary bomb fires at Neate Street, when water wasn’t quickly to hand. As with all their bottled wares, distribution was by horse vans. 50-70 might service a single yard, delivering direct to consumers. In summer, additional coal vans would be hired, while demand for coal was slack. R Whites proudly boasted “Any order of any size, delivered by Friday”. Petrol vans eventually displaced horse drawn vehicles. The timing wasn’t ideal. Introduced in 1938-9 on the eve of war, in 1940 much of the Bedford van fleet was promptly commandeered by the government for the war effort, being remarkably similar to army utility vehicles. 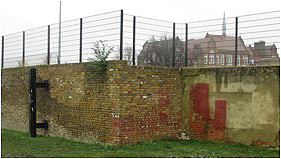 The last vestige of R Whites’ premises; the perimeter wall demolished in 2013. After the war, steady growth, modernization and mechanisation continued. In 1961, the Barking factory became the biggest prototype plant in Europe, producing 4 bottles every second. So what ultimately became of R Whites? It was bought by Whitbread brewery in 1969. It still had 21 premises in the South East and Midlands. The celebrated 1973 TV ad campaign made a household name of what had already become one of the UK’s most recognised brands. 1986 saw it absorbed into Britvic Ltd. Production had moved out to Beckton in 1972, where it continues to this day. Though the bottle may have changed, R Whites lemonade still contains real lemons – it is made with nearly the same recipe as 169 years ago. They were discovered lying on bare soil beneath the floorboards during the recent resoration of north wing of the satation, presuably discarded by no-longer-thirsty builders! Could you please say when the R Whites depot in Eastern Road Brighton was closed? Please may I use the information on a web page remembering Caroline Rennles maiden name Caroline Webb who was born in Camberwell and lived at 45 Harling Street. She worked at Slade Green Munitions Factory during the First World War. Here is a link to her Life Story on Lives of the First World War. I am interested to learn more about the early history of R.Whites for a TV documentary and would be interested to hear from anyone with a knowledge or early R.Whites memorabilia. where near number 133 – 137 Neate Street please? I have a clay R White bottle that I found while working in Elstree in London. It has a few chips but is intact. I wondered if it is worth anything? Lived in Neate Street 1942-1963 when we were moved out from prefabs to make way for the so called next Hyde Park. Remember also Haycock Press and the tent factory. Our prebab no was 42 . I lived in St Georges Way. My Aunts family lived in Neate Street. I regularly collected your bottles for the refund along with paper etc. I remember well the horse and carts delivering. My Uncle Bert Lambert owned the grocers shop on Neate Street. My great grandmother worked there in the early 1900’s. Isabella Eliza Wright nee Brown. Can’t find any trace of her after 1901 census or her husband Edward Robert Wright. My grandfather Edward Daniel Wright, born in 1899, always said he had no family but as a family we have always wondered what happened to his parents. Only document we have of both of them being together is their wedding in September 1899. Then he vanishes and Isabella is living back with her son at her parents home the Browns. We found this in the census, where it states her occupation as a bottle washer at the R Whites factory. A friend just gave me 5 ginger beer stone bottles! What a pleasure! Apparently her husband who works as a contractor found them in a pub in London Bridge when demolishing / refurbishing the area. One of them still has the original cork! I am quite excited to display them at home! Does any one know what the C&L stands for? Camberwell and something? Or not? Found this bottle this morning in Hindhead on the site of an old cafe The Golden Hind, on the A3 just down from the Devil’s Punch Bowl. Still half full, but only ground water! My grandmother was injured by the 19th October Zeppelin bomb on Albany Road where she lived. She was near the Fish and Chip shop when the bomb hit. She was carried by a police officer to the safety of R Whites. That police officer later became my grandfather. My grandmother told my mum that her friend was killed during this raid, I think it might have been Alice Glass. My great uncle Thomas Kirtland was a Mineral Water Salesman in 1911. He lived in Windsor. I am not sure who he may have worked for. I believe R. White’s is a possibility. Does anyone know ot any records that might help me to determine this? Did any of the White family live in a large house at the top of Logs Hill, Chislehurst, Kent? Possibly two sisters of this family lived there. Today I found a glass bottle on the shore of the Waddenzee, near Wierum, Friesland, the Netherlands. It has R. White on it at the top of the bottle. At the bottom it has the following mark: 1457H REGD No 888325 R. I would like to find out some information about it. For example when it was manufactured and what kind of drink it contained. Would you be able to help me? My great grandfather, Frederick Harman, was a bottle washer according to the 1911 census, living at 35 South Street. His father was a carman (mineral water) at the same time. I know it’s a long shot but I wondered if there are any employment records from then? I was told my grandma Ivy Gates lived in as a servant at the R Whites home. This must have been around 1918 to mid 1920s in her late teens and mid twenties. Are any of the family around to ask if any stories etc were past down from generation to generation or if any diaries were written? I’ll have to wait for the 1921 census to see if grandma was mentioned on there and where she lived.